Is it just me, or does December seem to come with the expectation that it will be a 31 day eat-a-thon? Yes, I’m aware that many people celebrate Christmas and that may include attending multiple Christmas parties. But that doesn’t explain why so many people choose to overeat during the month of December (and then choose to restrict themselves and follow the latest diet in January.) People repeatedly say they wish they hadn’t eaten so much. So why do they? What makes millions of people eat to the point of discomfort and regret year after year? 1. Deprivation = risk of overeating. If you regularly tell yourself (eg. January to November) that certain foods are “not allowed,” this will permanently distort your thinking about these foods. Chocolate, mince pies…it does matter which food we are talking about. Feeling deprived makes it more likely that December will roll around and you will start to think, “I better eat it now while I have the chance.” It’s called “last supper” mentality and it also takes place on a Sunday when people plan to start dieting on a Monday (eg. “I better eat all of this chocolate now just to get it out of the house.”) If you truly believe this is the last time you are ever going to be allowed to have some chocolate or a cookie or whatever, it is human nature to want to eat as much of it as possible. Why? Because what if you want it in the future and it isn’t there? Now compare this to foods where you know you can have it any time that you want (eg. a digestive biscuit). My guess is you will be much less likely to overeat or eat this food when you are not hungry. 2. Fear of missing out = risk of overeating. People hate to miss out on a great experience. I mean, “what if this is the best fudge in the history of the universe, and I missed it? I better have some.” But think about this…are you REALLY at risk of missing out? In the Uk at least, you can go to any carvery, on any Sunday, 52 weeks a year and eat turkey, stuffing, roasted and mashed potatoes. 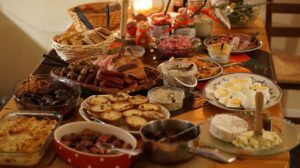 So then is it really necessary to eat an excessive amount of these foods on Christmas Day? I’m sure I saw mince pies on sale in the supermarket last year until at least April. So do you really need to eat an entire tray of 6 in one evening? Ok…maybe if your family traditions include uniquely special foods prepared in uniquely special ways, then I completely understand why there might be a temptation to overindulge. But I don’t think this is the main reason most people overeat. You know why? Because I also see people eat excessively at buffets when the food is mediocre at best. What always cracks me up is when I see people teetering a store bought bun on top of a mountain of food. You can have that bun 365 days per year….is that really what you want to waste your precious stomach capacity eating right this minute? Perhaps that is a conversation you want to start having with yourself at other times of the year as well. 3. Linking food to happiness = risk of overeating. I’ve noticed this a lot recently – advertising which seems to be taking an even more blatant approach at linking food and/or alcohol with either happiness, a reward and/or relaxation. So when you are frazzled, stressed out and knackered during the month of December, who wouldn’t want a spiced pumpkin latte with a pastry which promises peace, tranquility and bliss? Or some Bailey’s hot chocolate? But does it work? And how long do the effects last for? Or is eating and drinking the only time you ever give yourself permission to sit down and do nothing for 30 seconds? Hmmm…that is a different issue altogether. 4. Eating whenever you see food = risk of overeating. People who rarely struggle with their weight, usually make decisions about when and how much to eat based on their body’s internal cues for hunger and fullness. People who frequently struggle with their weight, let external cues (like seeing food, seeing other people eating or what time it is) dictate when, what and how much they eat. If your habit is to eat food every time you see something on offer, you will definitely struggle during the month of December when it seems like food is available everywhere. But are you physically hungry? Do you even want that food? These are helpful questions to ask before you dive right in. 5. Eating to manage emotions = risk of overeating. Christmas can create a multitude of emotions and the reality of Christmas rarely matches the hype portrayed in the media. Instead of a blissfully calm environment, happy children and relatives, and a perfect Christmas meal, you may be faced with tears and disagreements, sadness over people who are no long with you, annoyance that you have to spend time with relatives who you don’t like or have little in common with, loneliness and/or stress around how much everything is costing. If food (or alcohol) is your primary way of coping with these emotions, December is going to be a challenging month for you. Perhaps it’s time to start thinking about non-food (and non-alcoholic) ways to cope with challenging emotions — options may include things like meditation, mindfulness colouring books, journalling, art and music just to name a few. So what do you think? Do you agree or disagree with my list? Let’s hear your thoughts in the comments below. Perhaps you have other theories I haven’t considered. Just remember that you always have a choice. You can break out of the overeating-restriction cycle any time you want. In fact, what if this year, you enjoyed yourself without overdoing it and you didn’t need to lose any weight in January. What would that even look like? To receive more articles like this one straight to your inbox, sign up for my weekly newsletter at http://eepurl.com/dxu6rT. And if you want 1:1 support to change your eating habits and your mindset around food and weight, my team and I are here to help. Get in touch at: info@eatgreatfeelgreat.co.uk.